Play dough toys must be several things: durable, versatile, not-a-choking hazard and most importantly – easy to clean! So many of the kids favorites we don’t *actually* play with as they are a pain to clean up afterwards. What I love about this toy option is that the play dough just falls off once it’s dry. No more scrubbing!! 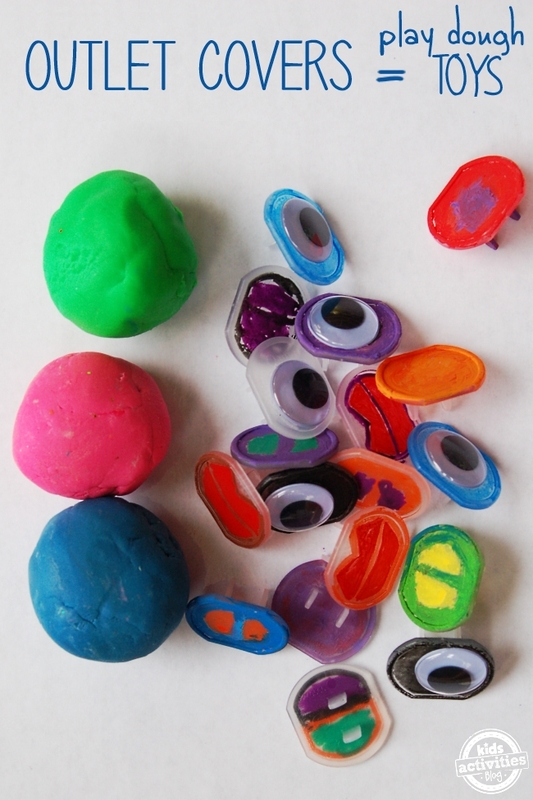 Pictured are a number of our batches of play dough. We use gel food dye to get intense colors – liquid dyes just don’t cut it! Chocolate Play Dough – yumm! 11 favorite play dough recipes – including several gluten free and edible versions. Every recipe on this list I have tried and my kids have enjoyed. I love it when the kids look at my “plan” for a project or an activity and change it, add to it and create something all new and all their own creation. 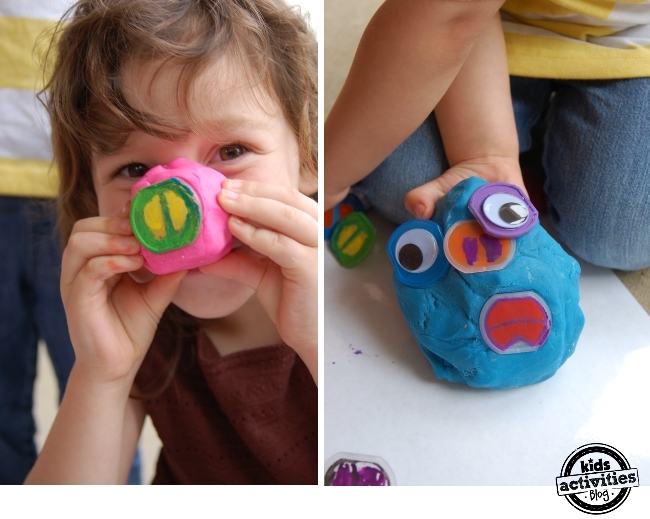 We were inspired to create face parts from reading about Allison, of No Time for Flashcard’s, playdough activity day. I had every intention of drawing eyes, noses and even ears onto our covers. The kids had a better plan. 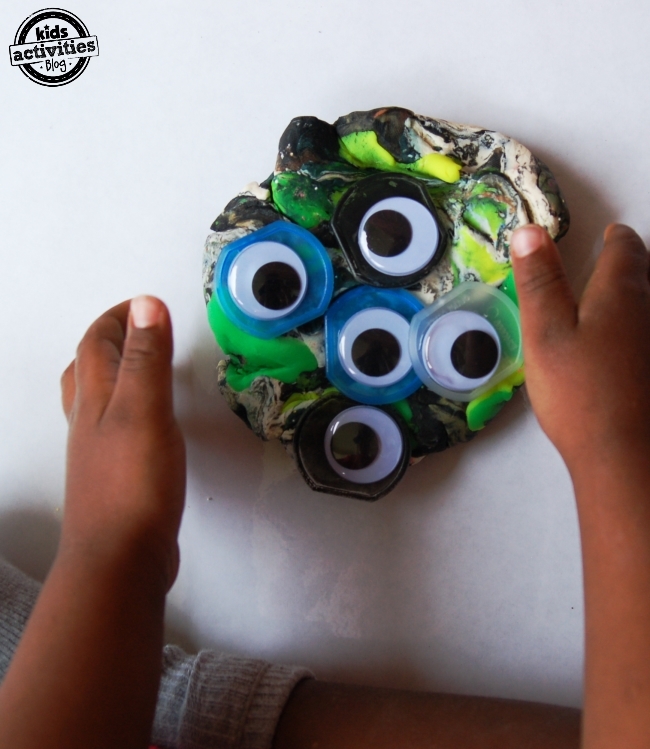 They dug out the remaining googly eyes that we had and the hot glue gun. We glued those to the covers. And instead of human noses, the kids made pig noses. There was much snorting and giggling going on as they created their faces, and wore the “masks”. My only regret is that we did not have more googly eyes. They were in high demand – you can never have enough eyes! 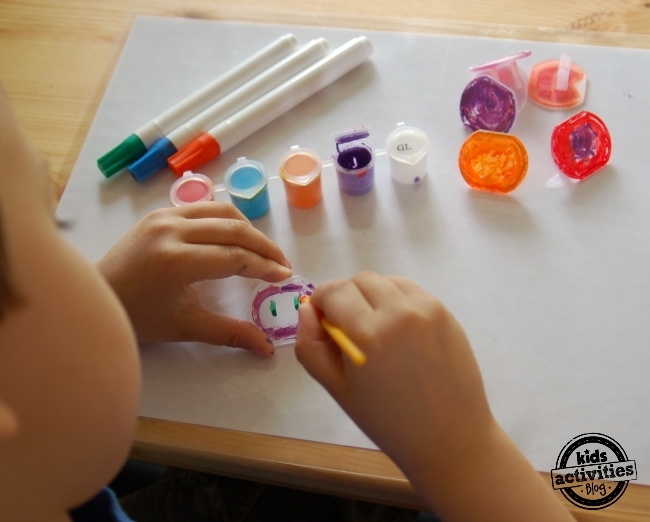 Previous Post: « 101 Kids Activities that are the Bestest, Funnest Ever!